If you get any of the following questions during an interview then either the interviewer did read this one or he’s getting info from the same sources as I am. Either way, let’s get one step forward. Fun, isn’t it? The follow up question obviously is “what if the loader’s rights are unproperly set” or something similar. The answer to that is that not all the filesystem issues are fixable with easy commands. One may even have to mount the file system on a different installation (e.g. from a Live CD or attach the virtual storage to another, “good” node) and fix things up from there. DevOps: some people think it’s a hype, a sysadmin job redefined, other people believe it’s just another skill you get from some training or out of school. It’s neither. I personally would say it’s a combination of skills; you get some from school, other from formal training and the rest from the daily hands-on job. Why is it not just some SysAdmin job redefined? The “classical” SysAdmin (usually) deals with physical nodes and a good part of his/her daily job is fixing storage issues (rebuilding file systems, restoring from backups), debugging various hardware incompatibilities and applying patches. Why do (serious, formal) coding skills matter for a DevOps? The current industry trend is to express infrastructure through Code. You can currenty spawn entire environments (e.g. in AWS) with properly sized hardware configurations and services installed through Code only; this is possible with Automation tools like Chef. This is not about simple scripting skills but there are no complex algorithms either. 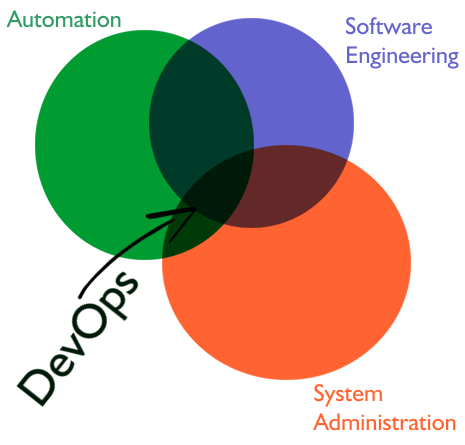 As I have just mentioned, DevOps is defined through Automation as the node interaction is no longer almost entirely manual. One now runs commands to multiple nodes at once and employs various automated monitoring tools that raise alarms and (sometimes) trigger tasks that do fix those issues, including, but not limited to, scaling resources or even adding new nodes to some cluster. Who needs DevOps skills? I think that any organization that employs a large computing environment, large enough that scaling through classical SysAdmin operations is no longer feasible or cost-effective. Or, for that matter, any organization that intends to move its infrastructure to the Cloud. Being a new position that cannot be put in the same category with Devs, SysAdmins or QAs, there may be difficulties in filling up the job requirements, the career path or even deciding the compensation, but things are starting to change. This was my introduction to the DevOps concept. Thank you for your read!